Innovative Solutions for plant and machinery – this was LTG’s theme of participation at Hannover Messe 2019. 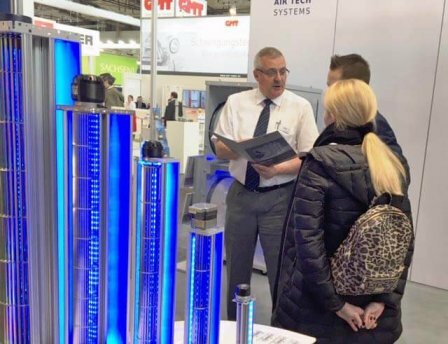 The visitor‘s attention was drawn on several components of our LTG Filtration Technology – a fine filter and a fibre compactor, as well as the full range of tangential fans. From our smallest series with impeller diameter 25 mm to the powerful VQ series we pointed out the countless application possibilities in extreme conditions from -180° C to +800° C for our cross-flow fans. Hannover Messe – the world’s largest industrial fair – is a significant platform to meet visitors from all over the world, which is also reflected at LTG’s booth: half of our visitors came from abroad, a very positive balance for us. We have recorded an increase in visitors. But not only the extra visitors was crucial, but also their quality, leading experts and decision-makers were pleased with our products and had inspiring conversations with our sales team. We thank all our visitors for their interest and are looking forward to a number of new Projects.